The European Central Bank cut interest rates Thursday to try to boost Europe's economy but failed to take more dramatic measures -- disappointing investors. But it said those purchases would continue at a rate of 60 billion euros ($65 billion). 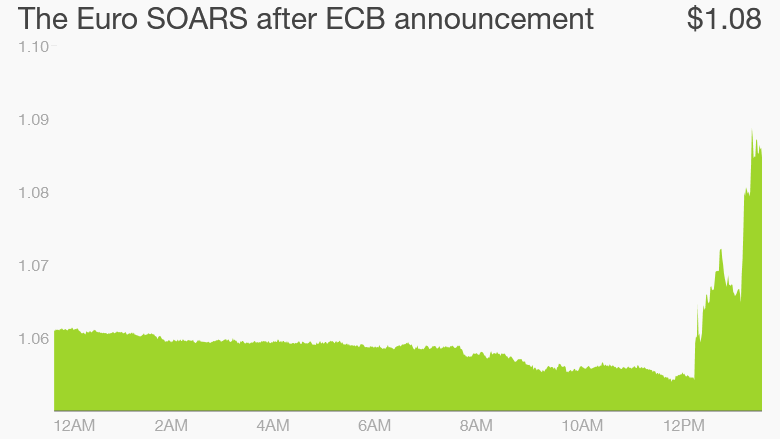 Markets were expecting the ECB to announce an increase of at least 10 billion euros a month. Investors had bought stocks and sold the euro in anticipation of much more money sloshing around the eurozone. European stocks fell sharply after the ECB announcement -- Germany's DAX index slumped by more than 3% -- and the euro soared by more than 2% to $1.08. 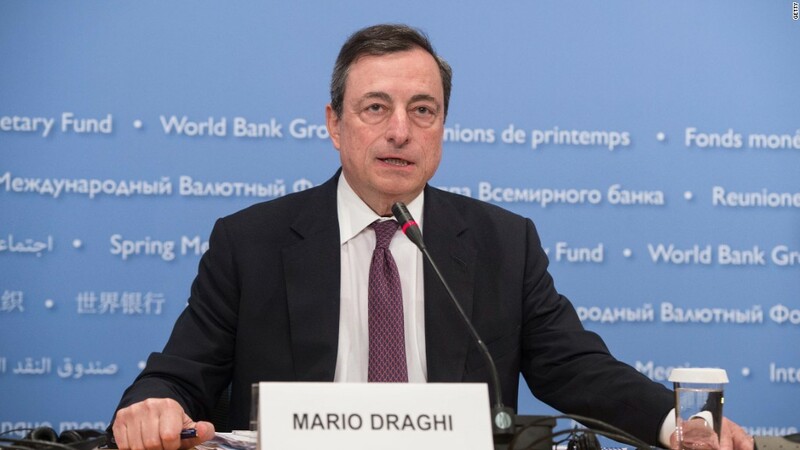 "The wider expectations were that Draghi [was] going to come with his guns blazing, but today is certainly not the day for that," noted Naeem Aslam, chief market analyst at Avatrade. The ECB's current stimulus program -- known as quantitative easing -- was launched in March. Back then, ECB President Mario Draghi said the effort would run at least until September 2016, giving it an initial value of 1.1 trillion euros. While more modest than many were expecting, Thursday's rate cut leaves the two most powerful central banks in the world moving in opposite directions. Federal Reserve chair Janet Yellen signaled on Wednesday that the first U.S. interest rate rise in almost a decade was likely when it meets December 15 and 16. Markets were thrown into confusion just before the ECB announcement when the Financial Times published a story online saying the bank had decided to keep interest rates unchanged. The FT later tweeted a correction.